Update: Thanks to your support, all redemptions for the “Top up at least $30 worth of GrabPay credits and get $8 off Grab rides next week” promotion have been taken up as of 25 June 2017, 10am. Top up at least $30 worth of GrabPay Credits between 23 June (10am) and 25 June (11:59pm) to unlock this offer. If you’ve successfully unlocked the promo, you’ll receive an email from us at 26 June, 6AM with further instructions on how to redeem your promo. Use the promo code and pay with your GrabPay credits to get $8* OFF Grab rides from 26 June (6am) – 2 July (11:59pm). And yes, the amount you top up will be credits that you can use on top of the $8 promo code. Please see below for an example. Yes, all Grab services except for GrabShuttle and GrabHitch as long as it’s between 23 June (10am) – 25 June (11:59pm). Redemption valid only with use of the promo code sent to you. Capped at 4 redemptions per user per day. It is limited to the first 50K eligible top ups between 23 June (10am) and 25 June (11:59pm). 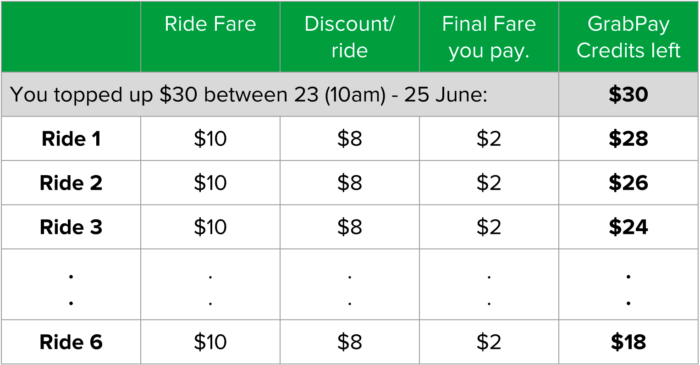 The ‘$8 off grab rides next week’ promotion will start from 26 June (6am) – 2 July (11:59pm). This offer is open to the first 50K passengers who top-up at least $30 worth of GrabPay Credits between 23 June (10am) and 25 June (11:59pm) If you qualified for the promotion, you will receive a email with the redemption instruction, for the $8 off rides offer, at 26 June, 2017, 6am. To claim the offer, please follow the steps listed in the email. You do not need a promo code to top-up the credits. If you qualified for the promotion, you will receive a email and a push notification with the redemption instructions, for the $8 off rides offer, by 26 June, 2017, 6am. To claim the offer, please follow the steps listed in the email/ notification. “Top-up at least $30 GrabPay credits between 23 June (10am) and 25 June (11:59pm) and unlock $8* off all rides next week! ” (“the Campaign”) is organised by Grab Pte Ltd. (“the Organiser”) and is open to all Grab users. The campaign will run from 23 June (10am) and 25 June (11:59pm (Top-up of at least $30 GrabPay credits) and from 26 June (6am) – 2 July (11:59pm) ($8 off all Grab Rides). Grab Pte Ltd reserves the sole and absolute right to alter or end the contest at any time, without giving prior notice or compensate in cash or in kind.